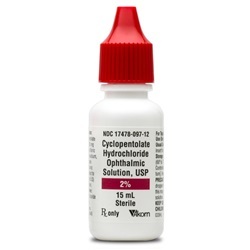 Sterile Cyclopentolate Hydrochloride, 2% ophthalmic drops in 15mL dropper bottle. Formerly known as AK-Pentolate, compare to Cyclogyl. Manufactured by Akorn. NDC Number: 17478-097-12. Comes as singles.